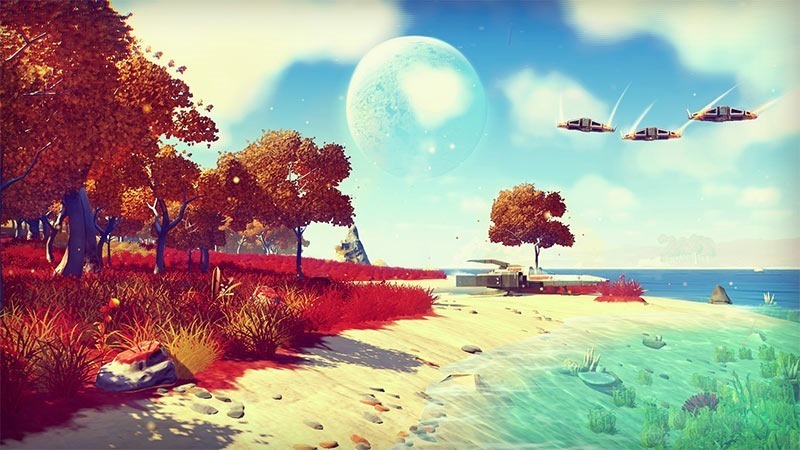 No Man’s Sky is a terribly ambitious game in the vein of Elite and its sequels – it’s all about exploration in an unbelievably vast, procedurally generated world, or indeed, multitude of worlds. Still, it’s generating a lot of confusion. Redditor vyper248 wants to put an end to much of that confusion, and has compiled just about every little bit of info on the game you need to know, from a variety of sources. Here it all is. Credit to vyper248 and a rather detailed reddit thread. Almost everything is Procedurally Generated. Ships, Plants, Animals, Planets etc, meaning there are going to be a very large number of variations of each of those things. All the variations will come from a base model though, and there will most likely be a lot of base models in each category. Don’t expect cutscenes, dialogues or much text within the game. It’s basically up to you how you play. The universe is a living breathing place that just works. Shipping lanes, trade routes, freighters, space stations. Planets have ecologies. It’s been mentioned that you can run into other players, but it’ll be very rare, and the details are very unclear right now. For example “there is the ability to communicate and work with other people” is something Sean said. He also mentions that he is inspired by how Journey and Dark Souls do it. So if you run into another player, you won’t know who they are. You don’t have an inventory, but you do have a sort of bank account. There will be ancient artefacts for you to find which could reveal the secrets of the universe. Everyone starts in their own solar system, so people will be very far away from one another to begin with. Each ship will have between one and three different armaments attached, and you’ll be able to upgrade them. The cockpit of the ship will be the lifepod, so if the ship is destroyed then you go back to a lifepod and you’ve lost that ship. Fuel will be really expensive, and is used to travel from one solar system to the next, like a hyper jump. A quick and cheap way to get fuel is to go down to a planet and do some mining, but you can also make money other ways and use that buy fuel. Other points of interest include crashed ships, beacons, something to discover like mountain ranges, a vast lake, new species of creature. Previous article Where will Telltale’s Game of Thrones be set?